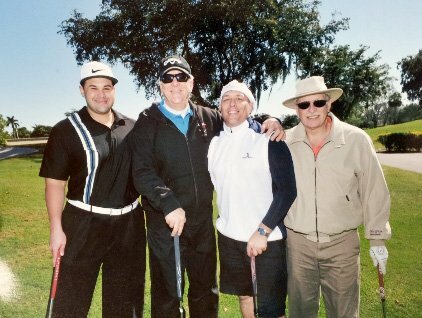 Managing partner Dennis Schaefer of Attorneys Dell & Schaefer recently participated in the 17th Annual Andy Schultz Golf Classic to support Jewish Adoption & Foster Care Options (JAFCO). The event was held at Woodlands Country Club in Tamarac. Dell & Schaefer supports JAFCO’s mission to care for abused, neglected and special needs children in the Jewish community, and to work in partnership with families and the entire child”¨welfare community. “We are proud to support JAFCO. The organization does an outstanding job of ensuring that children in need find safe and loving homes,” stated Schaefer. To learn more about the JAFCO, visit www.jafco.org. Ã¯Â»Â¿Founded in 1979, Attorneys Dell & Schaefer is a law firm representing the disabled and injured. The firm regularly participates in community events and is actively involved in giving back by supporting numerous charitable organizations and causes. From left, Frank Demeth, Dennis Schaefer, Adam Dougherty and Dr. Elliot Ser.